Masala chai, or “ spiced tea,” is known for its abundance of warming spices. There are many chai spice variations based on region, family tradition, and individual preference. Here’s a guide to the masala chai spices used in India and beyond. Cinnamon – Rich, pungent, tannic cinnamon is a must for most masala chai. Whole cinnamon sticks are more common than powders. In the U.S., cassia (usually sold as cinnamon) is an adequate replacement for true cinnamon, which is paler, more delicate and made of many thin layers of bark (rather than thick sheets of bark). Cardamom – The sweetly aromatic cardamom seed pods are considered to be cooling by some. Cardamom balances the masala chai spice mixture with its distinctive flavor and fragrance. Green cardamom pods that are lightly crushed and roasted just before they are boiled will yield the more rewarding flavor for masala chai. Green cardamom may be purchased cheaply in Indian or Asian markets. In some recipes, green cardamom may be called “elaichi" or "elchi,” which is its Southern Indian name. Cloves – Intensely spicy cloves give masala chai an incredible depth and act as a perfect foil to its creaminess and sweetness. Although whole cloves (which resemble small tacks or nails) provide the best flavor, powdered cloves work, too. Ginger – Hot-yet-sweet ginger turns masala chai’s spices up to 11. Finely chopped fresh is always best, but you can also use crystallized ginger (just remove some of the sugar from your recipe to balance it out) or powdered ginger in a pinch. Peppercorns – Piquant peppercorns are the least popular of the common masala chai spices, but many say chai isn’t chai without them. Cracked black peppercorns are typical. However, whole black peppercorns are preferred for masala chai that is made from a blend (rather than from scratch) because they retain their flavor better during storage. For a milder pepper flavor, white or green peppercorns may be used. Ajwain – This bitter Indian digestive spice tastes like strong thyme or caraway and is rarely used in chai outside some regions of India. Allspice – Freshly ground or pre-ground allspice tastes like a blend of many sweeter spices, giving masala chai additional complexity and depth. Bay leaves – They’re not just for soup! In parts of India, they are an essential spice for masala chai. Fresh leaves have a mild flavor, while dried leaves have a more intense taste. Indian bay leaves have a flavor more like cassia (the spice that is commonly sold as cinnamon in the U.S.), making them ideal candidates for chai. Coriander – Coriander comes from the fruit of the cilantro plant, but it is commonly referred to as the “seed” of the plant. In the beverage world, it is known as a major flavor component of many Belgian witbiers and an optional spice in masala chai. It gives chai a slightly citrusy flavor while staying in line with the overall theme of spicy sweetness. It’s best when roasted and ground just before use. Chocolate – Chocolate is a distinctly Western contribution to chai. It may be added as chocolate bits, cocoa powder or even chocolate syrup. 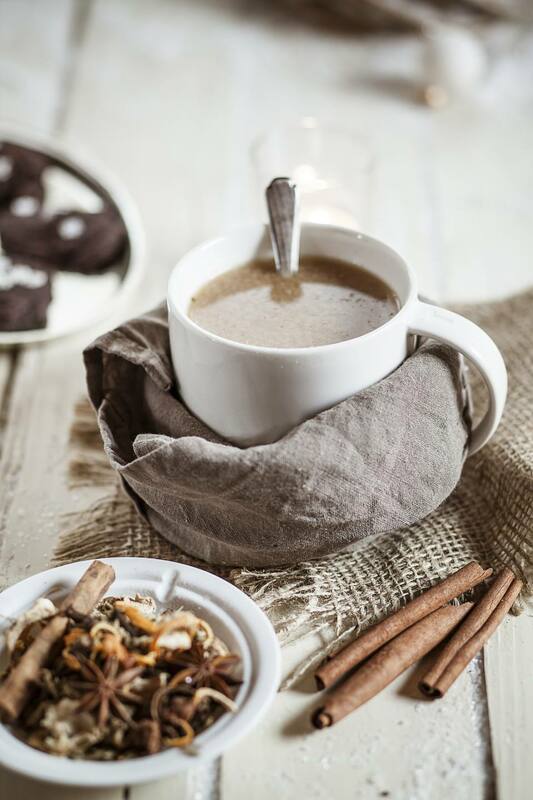 Many coffeehouses offer chocolate chai tea, and some also offer vanilla chai tea, hazelnut chai tea, coffee chai tea and more. Lemongrass – In America, zesty lemongrass is usually associated with Thai food, but two varieties of the plant are used in traditional Indian cooking. Fresh lemongrass gives masala chai a fresh, citrusy note that is particularly appealing in chai teas with lots of ginger. Licorice root – As a “love it or hate it” flavor, licorice is best used with caution in masala chai. If you love it, you can add it to chai fresh, dried or even in the form of teabags. Start with a little and add more to taste. Mace – Mace is made from the protective covering of the nutmeg seed. It has a similar flavor but is more delicate. It is best in small quantities in milder chai blends and it should be added at the last minute for the best flavor. Interestingly enough, it can give masala chai a slight orange tinge. Nutmeg – Nutmeg is commonly associated with mulled wines and ciders. With that kind of a stellar hot beverage track record, it only makes sense that it’s great in chai, too. It has a sweeter, stronger flavor than mace, which comes from a different part of the same plant, but (like mace) it’s best when added to your simmering chai at the last minute, just before serving. Saffron – Saffron’s price point makes it a “special occasion” chai spice. It has a bitter flavor and imparts a bright yellow color. Use it in small quantities as a featured ingredient in milder masala chai blends. Star anise – Star anise is used in everything from Galliano liqueur and Sambuca to Chinese “five spice” blend and Indian “garam masala” spice blend. It can also be used to impart an anise-like flavor to chai. It’s a very robust flavor and is best used in small quantities. Tamarind – Fresh or powdered ripe tamarind adds a sour, fruity note to many Asian beverages, including some versions of masala chai. It can be found in Indian markets. Some say it is an acquired taste. Vanilla – Like chocolate, vanilla is a Western addition to chai tea. Vanilla beans impart a better flavor than extracts, but they are very expensive. Pure vanilla extract can be used instead, but remember that it doesn’t take much extract to get a wallop of vanilla flavor. White poppy seeds – In parts of India, roasted white poppy seeds (also called “khaskhas”) are used in masala chai. This is not to be confused with the controversial South Asian “poppy tea,” which is made with ground poppy seeds and contains low levels of opiates. Blue and gray poppy seeds are more widely available in the U.S. and can be used in lieu of white poppy seeds. Did You Know Chai Tea Is Thousands of Years Old?